'Unsurprisingly, therefore, numerous cases indicate that transitioning animals to healthy vegan diets can result in increased overall health and vitality, decreased incidences of cancer, infections, hypothyroidism (a hormonal disease), ectoparasites (fleas, ticks, lice and mites), improved coat condition, allergy control, weight control, decreased arthritis, diabetes regression and even cataract resolution.' By Dr Andrew Knight European veterinary specialist in animal welfare science, ethics and law, and a professor of Animal Welfare and Ethics at the University of Winchester. I have been in rescue for over 20 years and during that time have witnessed alarming rises in early deaths and debilitating diseases in our pets, which are almost certainly due to vaccinations and diet. Yearly vaccinations, junk food kibble, the regular use of spot-on products and toxic wormers are sending many of our pets to an early grave or giving them illnesses not previously seen on the scale we are seeing them today. Did you know that a staggering 50% of dogs will now develop cancer - all down to what we are feeding them and giving them by way of unnecessary medications? This is outrageous and unacceptable. The evidence against vaccinations. Did you know that the oldest dog lived to 27 years which is 189 doggy years on a VEGAN diet? Vegan Dog Lives to 189 Years, a blue merle Collie called Bramble, lived in the UK and held the Guinness World Record for being the oldest living dog at the time. What's most amazing about this story is that the dog actually lived on a vegan diet of rice, lentils, and organic vegetables. 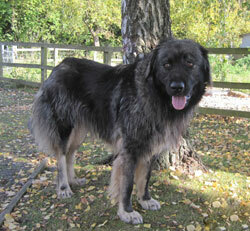 We have helped many dogs from other countries such as Romania and we see a totally different scenario with these dogs. They may have been abused by humans, but they are generally healthier than dogs here because their immune systems haven't been overwhelmed by toxic chemicals or vaccines and they have scavenged for food rather than being fed a junk diet of kibble. Even if you feed a raw food diet, you are feeding your pet foods that they would never eat if they hadn't been domesticated. When did you last see a dog hunt and kill a cow, a sheep or a pig? Dogs are not obligate carnivores, they are omnivores who would scavenge in the wild and eat a varied diet which would include fruit and vegetation. Haven't you ever seen your dog eating grass or plants? Then there is the moral question. If we are so passionate about our pets and call ourselves animal lovers, why do the majority turn a blind eye to the torture, abuse, and slaughter of billions of sentient creatures every year in order to satisfy both human greed and to feed their pets an unnatural diet? A plant-based diet is a way to ensure a long and healthy lifestyle for your pet and I will not now endorse any other type of diet. This diet will help eliminate many conditions such as skin and fur complaints, GI problems, behavioural problems and much more. Our 3 Caucasian Shepherds love their vegan food, they get far more variety than they ever did before and it's certainly more healthy. 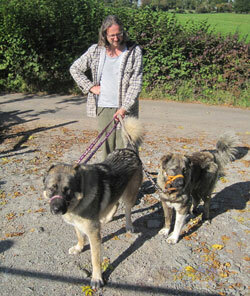 These dogs are all over 50kg but we have had no problems introducing them to their plant-based diet. They love raw veg too, especially raw grated carrots. It is important to buy organic if possible as root vegetables are often grown on land to remove heavy metals and there is the also the issue of toxic chemicals being used by non-organic farmers. Time to change but where to start? There is a wealth of information on the internet about feeding a vegan diet to your dog and it's not difficult to find simple nutritious recipes that your pooch will enjoy. Much better than boring old kibble. The truth about commercial pet foods is also available on the internet and why they are best avoided. All you need is some basic nutritional information, feeding guidelines, cooking the basics and ingredients to avoid. You also need to understand the protein myth, vitamins, minerals and any supplements that may be needed which cannot be derived from a plant-based diet. 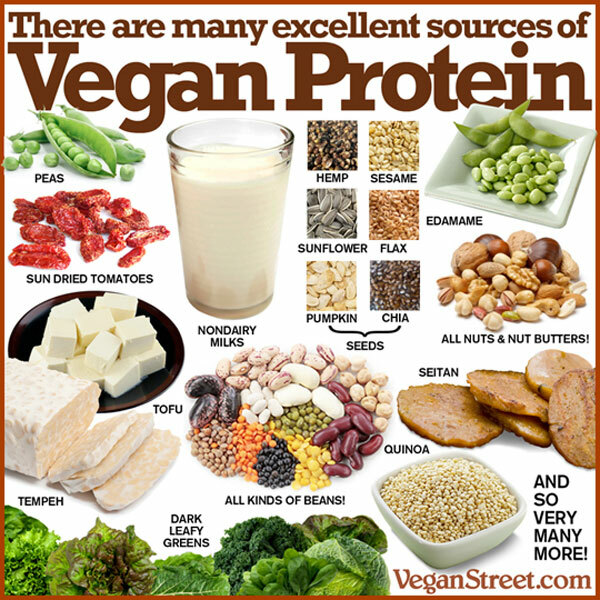 Dogs do have higher protein requirements than humans but as our graphic here shows, there is plenty of protein in plant-based foods and it's high-quality protein. 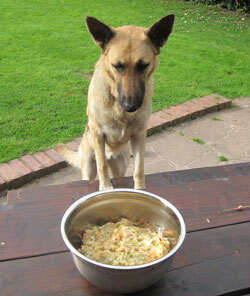 If you are serious about helping your dog achieve longevity, a plant-based, organic diet is the way forward. Buying these food items in bulk such as beans, grains, and lentils will dramatically reduce costs. RealFoods sell 25kg sacks of all beans, rice, and pulses which are very economical. Here, you can obtain more information about Vegan Dog Nutrition and get loads of ideas for vegan recipes for dogs from Matthew, the creator of Vegan Heartland. Omega-3 and Omega-6 fats control important hormones in the body, they’re both important so if your dog eats too much or too little of either one, then those hormones and his immune system will be out of balance. Good sources of Omegas are flax seeds or oil, chia seeds or oil, hemp oil, mung beans, green veg, and pumpkins. You can also make organic hemp milk for your dogs and mix it in their food. We don't recommend fish oils as our oceans are now polluted with poisonous metals such as mercury, other industrial chemicals as well as radiation from the likes of Fukushima which are ingested/absorbed by the fish and passed down through the food chain. Algal Oil Supplements offer tremendous benefits for dogs in the form of a sustainable Omega 3 rich source of long chain fatty acids. Why you should consider replacing your pet’s fish oil with this ecological, non-toxic alternative. The Benefits of Algal Oil for Dogs. This wonderful book written by Heather Coster will help you create nutritionally balanced meals for your dog that will even appeal to the fussiest eaters. In fact, the recipes are so delicious, you can eat them yourself. 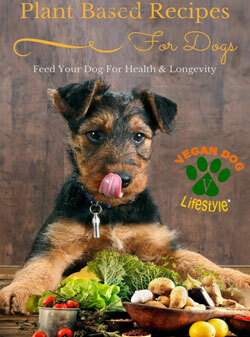 The book also has information on why veganism is good for your dog, promoting health and longevity. She also exposes the pet food industry and which is prodding food that is harmful and compromises the health of your pet. Many people believe that plant-based foods do not provide enough protein or that the protein is an inferior type of protein, this book busts open that myth with scientific evidence. 'I fed dogs in my care vegan because, in my opinion, it is not the prerogative of humans to decide which animals live and which die for dog food. Vegan dog food is better for dogs, the planet and carers; it's a win/win situation and no-brainer'- Anne Heritage, author of 'Bramble; the dog that wanted to live forever'. If you don't want to prepare and cook food for your pet, then choose an ethical pet food manufacturer although we don't recommend giving any kibble to your pets - it's processed junk which is why they refuse to disclose the exact ingredients that are in their junk!! "I think we are being mugged by some of the manufacturers of pet food. The labelling is unclear, ingredients are often hidden or moved down the list by smoke and mirror tactics like grain splitting. Products are marketed as hypoallergenic. when the ingredients suggest that is not the case In America, we can look at the full ingredients, but in the UK, we cannot. That really needs to be changed sooner rather than later. Science must get up to date on these apparently contentious ingredients. " Philip Wollen puts forward the most powerful argument ever that meat should be off the menu. It's not just a moral issue, it's a major environmental problem too. 'Meat today is the new asbestos, more murderous than tobacco. CO2, Methane and nitrous oxide from the livestock industry are killing our oceans with acidic hypoxic dead zones. 90% of small fish are ground into pellets to feed to livestock. Vegetarian cows are now the world's largest ocean predator. The oceans are dying in our time. By 2048 all our fisheries will be dead. The lungs and arteries of the earth. Only 100 billion have ever lived, 7 billion live today and yet we torture and kill 2 billion sentient living beings every week. 10,000 entire species are wiped out every year because of the action of one. We are now facing the 6th mass extinction in cosmological history. Animal agriculture is responsible for 18 per cent of greenhouse gas emissions, more than the combined exhaust from all transportation. Livestock and their byproducts account for at least 32,000 million tons of carbon dioxide (CO2) per year or 51% of all worldwide greenhouse gas emissions. New Research Suggests Dogs Can Thrive on a Plant-Based Diet. Dogg Canine Nutrition Company, based in British Columbia, just completed the world’s first-ever fresh, whole, plant-based, at-home canine feeding trial. As part of the program, 20 randomly selected dogs ate a vegan diet for 12 weeks. The awesome news: all of the pooches who completed the trial transitioned to their new diet without any issues, and many improved medically while on it. Clare Mann on vegan pets I choose for my dogs to be vegan because I cannot justify exploiting any animal for the benefit of another. The vast majority of animal food products are produced through extreme animal suffering, i.e. intensive farming. The suffering of animals in human food production is intense and happens behind closed doors. When it comes to dog food, the quality standards are much lower. Cheaper brands (I have investigated this) have been shown to often contain fillers like sawdust and mashed up animal parts. This is not widely known by consumers. Good nutrition for healthy vegan dogs Many people are surprised to learn that not only can dogs enjoy vibrant health on a vegan diet, but just like people, their physical condition can actually improve as a result of eliminating animal foods. Vegetarian Diets Can Be Healthy for Dogs: For both ethical and health reasons, many vegetarians and vegans choose to feed their companion dogs vegetarian or vegan diets. Up to 50 % of commercial pet food brands are comprised of "meat meal" and "byproducts," which include various body parts (such as beaks, brain, spinal cord tissue, bones, lungs, intestinal tracts) slaughterhouse wastes, 4-D meat (from dead, dying, diseased or disabled animals), supermarket rejects, as well as rendered dogs and cats from animal shelters. Other contaminants which have been found in commercial pet foods include old restaurant grease containing high concentrations of dangerous free radicals and trans fatty acids; PCBs, heavy metals and other toxins, particularly from fish; bacterial, protozoal, fungal, viral, and prion contaminants, along with their associated endotoxins and mycotoxins; hormone and antibiotic residues; and dangerous preservatives. Many speculate that the increase in incidences of cancers, kidney failure, and other degenerative diseases in our companion animals recently may be due to the harmful ingredients in many commercial meat-based pet foods. This has led people to feed alternative diets. Vegan Dogs!? : My dog Hazel is vegan. Most likely, your eyes just rolled or your heart stopped beating. You probably understand and respect my choice to be vegan but really, do I have to drag my dog into this? Well, here’s the thing: Dogs, unlike cats, are not obligate carnivores. They’re not dependent on meat-specific protein, and can easily digest the majority of vegetables and grains. That, combined with the fact that I don’t support horrific factory farming, means feeding my dog a veggie diet is the only way to go. Dogs eating vegan can be a very emotionally driven topic. For some, not feeding a dog any meat goes against the natural order of things. The problem with this line of thinking is that natural doesn't always imply good. In fact, the "natural" option is sometimes worse than the alternative! Dogs need a specific combination and ratio of nutrients, not specific ingredients. Finally, in looking at this we might consider, especially when it comes to how this report is spread and regarded, the captains of the meat industry might well like to discredit peas for the simple reason that pea protein (like soy and wheat, already thoroughly dissed perhaps with their help) is a major alternative protein source being used in many vegan food products, both for dogs and, more importantly, for humans. At the least, it's interesting how these things hit the big media when other, more important, findings do not. I say this not to dismiss valid findings, but just to take them with a grain of salt and to share them wisely. Perhaps it’s time to rethink food from a deeper perspective in every regard.